The Littlest Outlaw started as an idea for Walt Disney's weekly television series, Disneyland. Larry Lansburgh came up with the story after producing several animal films for the series, but Walt saw potential in the story and had Bill Walsh write the script as a feature film instead. It was decided that filming would be done in Mexico where the story was set and with a mostly Mexican cast. The film was shot twice in both English and Spanish for simultaneous release in multiple countries. The film is about Little Pablito, the stepson of a general's horse trainer. He learns that his stepfather has been hurting the horse during training and when the horse injures the general's daughter out of fear, he orders it to be killed. So Little Pablito steals the horse and runs away, becoming an outlaw. After narrowly dodging several who want to turn the horse in and staying steps ahead of his step dad, he is helped by a priest. But when the horse runs away, he ends up sold to a bull fighting ring, where Little Pablito rescues him. In the end, Little Pablito returns to the general's home and returns the horse. The film ends happily with the general giving Little Pablito the horse. 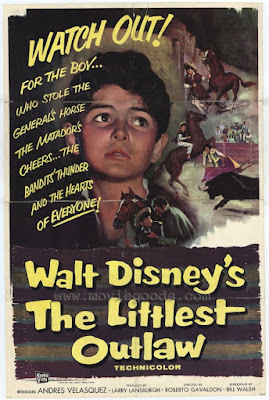 Walt Disney's The Littlest Outlaw premiered on December 22, 1955. It received mixed reviews from critics. Those who liked it praised the excellent performances and authentic setting. Those who disliked it were expecting something much more grand from Walt Disney who was still known for animation and live action films with a lot of spectacle. Since The Littlest Outlaw didn't fit the mold of what they expected a Disney film to be, it was bashed. Audiences didn't respond incredibly well to the film either and it was not a big success. I personally agree with the critics who praised the film. The acting is top notch and the filming locations make the film feel real. It is a very charming picture, but its main fault is that it feels more like an episode of Disneyland than a Disney film. Its other problem is that it is instantly forgettable. It is no wonder that this film has become so obscure that many of the most die hard Disney fans have never seen or heard of it. The Littlest Outlaw is currently available on DVD as a Disney Movie Club Exclusive. Pressbooks for this film didn't offer guidelines on how to present the film, so the full screen presentation on this DVD is possibly the original theatrical aspect ratio. It is also available on iTunes in fullscreen, where it is available in HD. There are many of these wonderful Disney films unavailable over here in Europe, which is so frustrating. Even my favourite, 'The Story of Robin Hood' is only available in the USA and that has a rather poor colour quality. As these great films are rarely seen on TV we are all missing out on this Disney magic! This is a great Disney blog keep up the good work!